This pumpkin soup is topped with smoky roasted chickpeas and fresh thyme, making it the ultimate cozy autumn recipe for busy weeknights! Chop the tops off the pumpkins, cut them in half lengthwise, and scoop out the seeds/stringy bits with a spoon. Rub a touch of olive oil on the inside of each, just 1 Tbsp total, then place face down on a baking sheet and roast for about 1 hour at 350 degrees F (175 C), until flesh is ultra fork tender. Set a whole red bell pepper directly onto a rack above the pumpkin. We’ll let this roast until it’s nearly black, turning it every 10 minutes or so. While that’s going, thoroughly dry chickpeas with a paper towel, removing any skins that come off. Whisk together 2 Tbsp olive oil, tamari, sriracha, maple syrup, and paprika, then gently mix in chickpeas. Spread onto a rimmed, greased baking sheet. When pumpkin is tender, remove from oven and replace with the chickpeas, leaving the bell pepper in there. Increase heat to 400 degrees F and bake about 20 minutes, shaking the chickpea pan halfway through to help them toast evenly. When the chickpeas are done, turn off the oven but leave them in there to stay warm. The bell pepper should be good enough at this point too, so take it out, set it in a bowl, cover the bowl with plastic wrap, and set aside for a few minutes to let the skin loosen. Back to the pumpkin. Scoop or peel the innards from the skins and set aside. Gently peel off the skin of the pepper, remove the seeds and stem, and chop it into chunks. In a large pot, bring 1 Tbsp olive oil to medium heat. Add shallots and garlic and cook until shallots become a bit translucent. Stir in the pumpkin, roasted bell pepper, vegetable stock, almond milk, and maple syrup. Puree using either a handheld immersion blender or, working in batches, puree the mix in a standing blender. Pour the soup back into the large pot and add salt, pepper, cinnamon, and nutmeg, being sure to taste-test for any seasoning modifications. Ladle a cup of soup into a bowl and top with a handful of chickpeas. Optionally garnish with thyme. Serve warm and with love! Adapted from the "bacon-y" coconut from Well and Full. 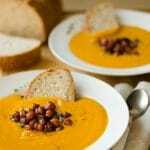 Recipe from Live Eat Learn at https://www.liveeatlearn.com/pumpkin-soup-with-smoky-roasted-chickpeas/.